I’ve posted tutorials for several versions of Cookie Cutter Garland that I made last year but I never got around posting the tutorial for this Paper or Foam Gingerbread Garland. I love this project because you can make it as simple or as complex as you wish and you can use whatever you have on-hand or can be purchased at a dollar store for under $5. I challenge you to complete your own garland without buying anything (or with whatever you can purchase for under $5) and send me a photo. I will definitely add your photo to the tutorial. Red & Green Wooden Beads (on hand) I used beads from a bead garland purchased years ago at a dollar store for $1. Gather or purchase your materials from your stash or make dollar store, craft store or flea markets. Punch all shapes needed to decorate the gingerbread men. 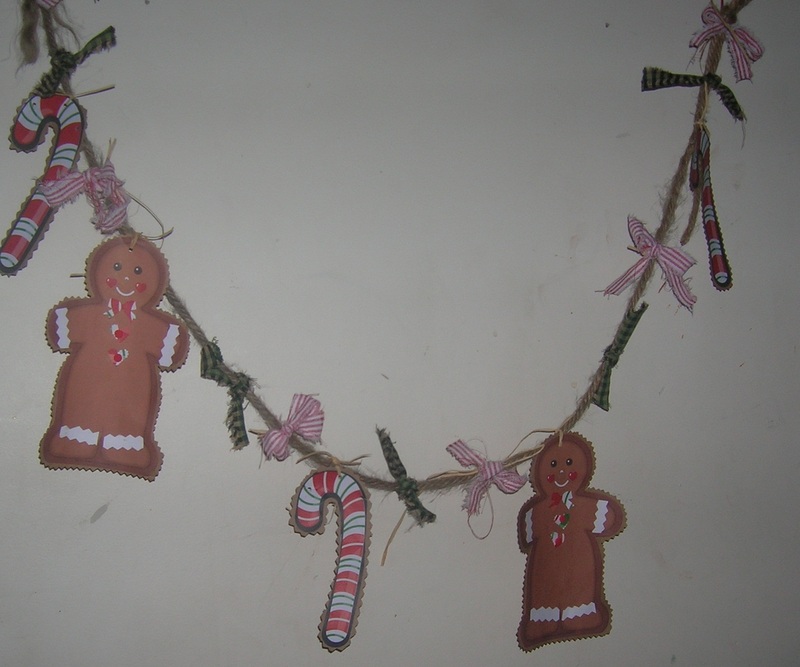 I used the pieces I trimmed off the candy cane garland to punch the hearts and bows from so that the gingerbread men decorations would match the candy canes. Make or punch cardstock “rick-rack”. PAPER RICK-RACK DIRECTIIONS: Make the with paper rick-rack made from cardstock (color of your choice – I used white) using zigzag scissors. I found that if you cut the cardstock in half lengthwise you can then trim the bottom straight edge (the short way) to start the rick-rack pattern, then place the scissors with the right edge of the blade touching the zigzag edge you can cut fairly even pieces of “rick-rack”. You could also use real rick-rack if you have it on hand. I recently bought a EK Success Slim Edger Punch: Zig Zag Chain and it’s now super easy to make evenly cut paper rick-rack for my gingerbread projects! Next decorate the gingerbread shapes. Glue paper or real rick-rack to the arms & legs (and head if desired). Then add heart, star or round paper or foam “buttons”. I added a center (from foam or paper) using a regular hole-punch shape to the heart “buttons”. Glue the bow on (paper punch or a bow made from a fabric strip). You can use any embellishments you have on hand to decorate your shapes. I found some plastic little girl bow barrettes that I cut the bow off to use. Cut out the candy cane shapes from wrapping paper or cut apart from a paper garland. You could also use pre-cut foam shapes. I found a package of large (10 inch) gingerbread shapes at the Dollar Tree and a set of smaller ones (6 inches) at Target for $1 for 10. Michaels and Dollar General also had red candy cane shapes (cut white foam stripes and add to cane if desired) at for a dollar. Fabric wrapped plastic candy canes could be used in the place of the paper or foam candy canes. You can also add other foam or paper shapes to the garland, like hearts or stars, to the garland. Reinforce the shapes (gingerbread, candy cane, heart, and star, etc.) by gluing them on a thin piece of cardboard or thick brown paper bag and trim close to the edge with scissors. Add a hole reinforcer if desired (see below). Add a decorative edging to the shapes by gluing them to a brown paper bag, cardstock (red, green or other color to match your décor), wrapping paper, etc. If using one-sided paper and plan to have a decorative edge showing face the paper to the front of the shapes. Then trim close to the edge or leave a decorative border with zigzag scissors. Punch holes in the shapes. For the first garland I made I punched pinpoint (1/4 inch) holes on either side of the shapes and connected them with raffia. I used clear hole reinforces from an office supply store to make sure the holes did not pull through. If you only have the white ones you can put them on the underside of the paper before gluing it together. Try putting the layers together leaving a gap at the top then put on the rein forcers punch the holes and then glue the edges together. You could also apply clear round labels before punching the holes. On the other garland I used a hole punch to put a hole in the top of the shapes and then attached them to the jute with raffia. Another option would be to string the shapes like beads. Measure and cut your stringing material to the desired length. I made mine four or five feet long but you can make it any length needed to fit your “space”. Attach the shapes by stringing them on jute or yarn like beads or by tying the shapes to a piece of raffia or a piece of torn fabric ribbon. Be sure to space them evenly. 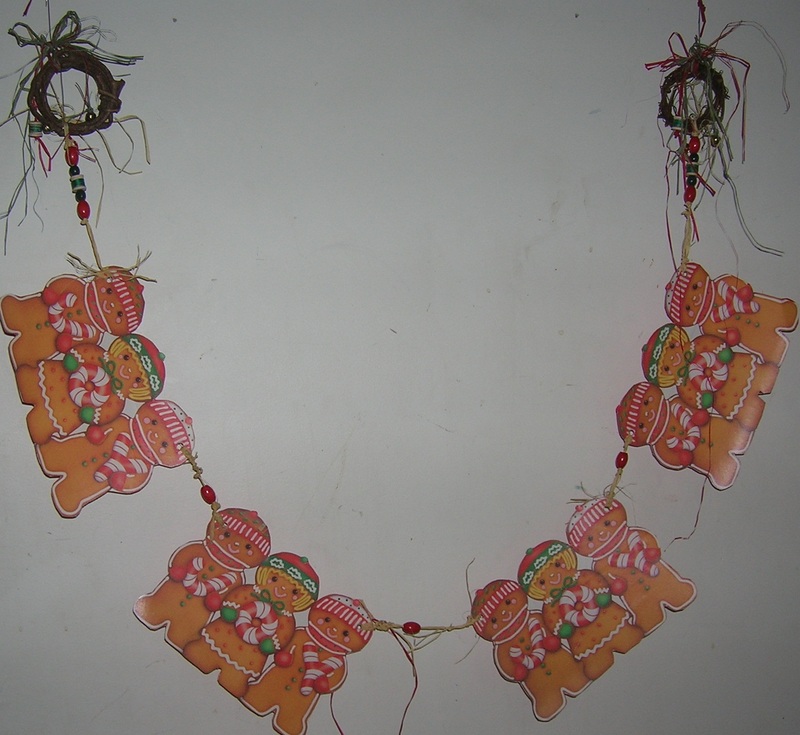 You can also tie the shapes together with raffia instead of stringing them or tying them on. If you space the shapes far enough apart you can use the “blank” space between to hang Christmas cards on. If desired add beads and small wooden spools between the shapes (I wound green thread around them the spools I used). 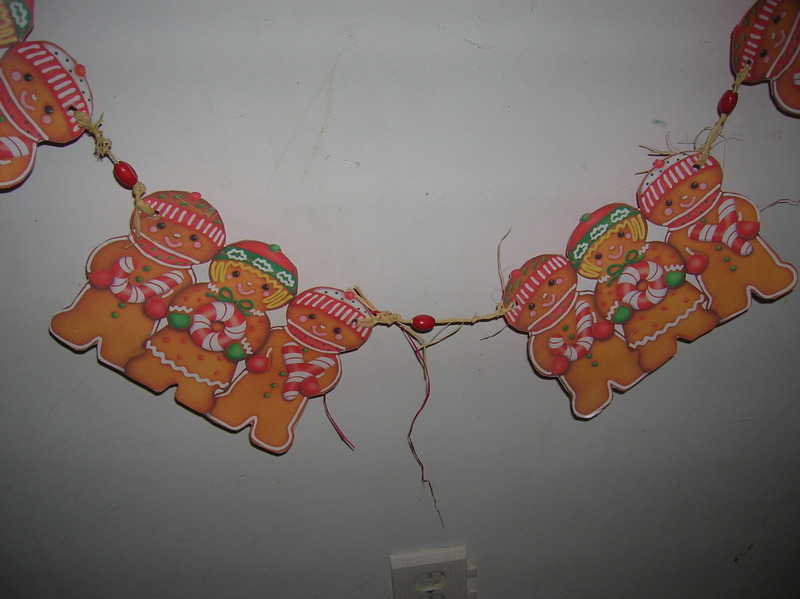 If your gingerbread shapes are big enough to be in scale you could use the small spools of thread found in a pack of 12 for a dollar at the Dollar Tree. 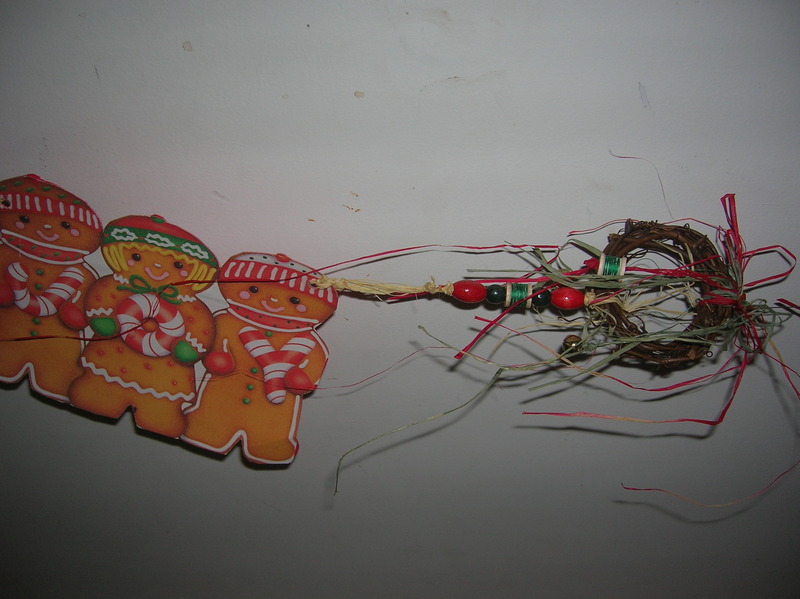 Make and attach bows then attach them at regular interval down the garland between the shapes. To make bows tear country print fabric (checked, plaid or striped in the colors of your choice) into 1 to 1 ½ inch wide strips and about 10 inch long. To make bows first tie a piece of raffia in the center of a fabric strip then tie a simple shoestring type bow. Use the raffia ends to tie the bows in place. An alternative of the shoestring bow is to tie fabric strips in different colors simply tied around the stringing material and then knotted in a double knot. Trim the edges of the bows as needed. Tie off the ends with small grapevine wreaths or simply loop the ends to create “hangers”. Your garland is now ready to hang. Hang it on the wall, above a door, on the tree or above the mantel. As this is made from paper, don’t use it where it could get wet (or catch on fire). HAND-CUT PAPER RICK-RACK DIRECTIIONS: Make evenly cut paper “rick-rack” from cardstock using zigzag scissors. • Cut a scrap piece of cardstock to about two inches lengthwise (the length of the scissor blades). You need to be able to make one cut through the paper with the scissors. • Trim the bottom edge evenly with the straight scissors. • Then start the rick-rack pattern by trimming the bottom edge using the zigzag scissors. 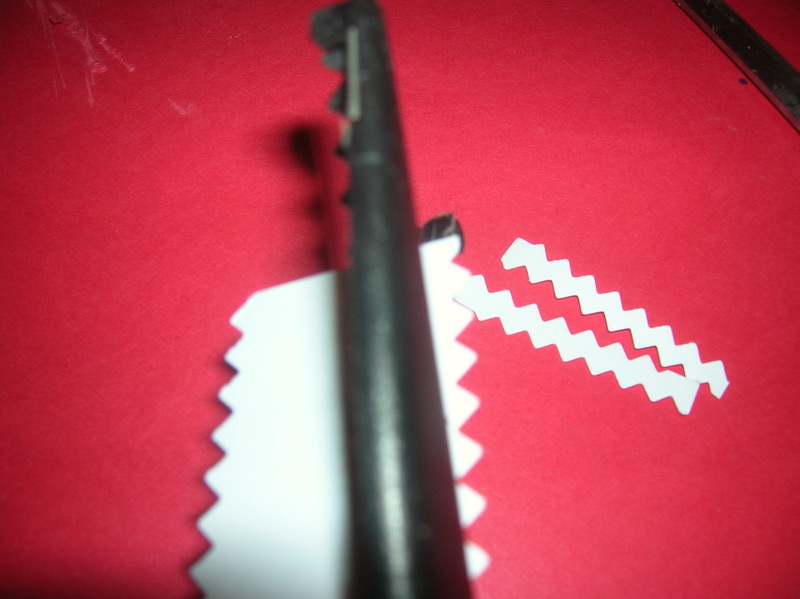 • FLIP the paper over and place the scissors with the right blade touching the zigzag edge you just cut. • Flip the paper and repeat again.